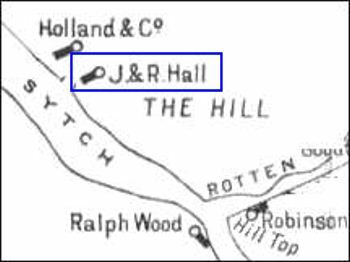 1802 1822 J & R Hall The partners were the brothers John and Ralph Hall - they had an earthenware business at the Sytch Pottery in Burslem and the Swan Bank Pottery in Tunstall. 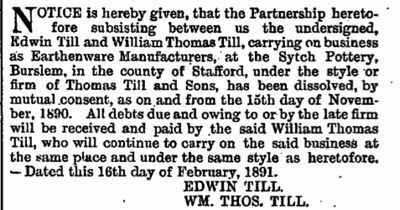 The partnership was dissolved in January 1822 - John continued at the Sytch Pottery in Burslem with his sons as J Hall & Sons. Ralph continued in Tunstall as Ralph Hall (& Co) (& Son). 1822 1832 J. Hall & Sons John Hall was in partnership with his two sons Joseph and Thomas. 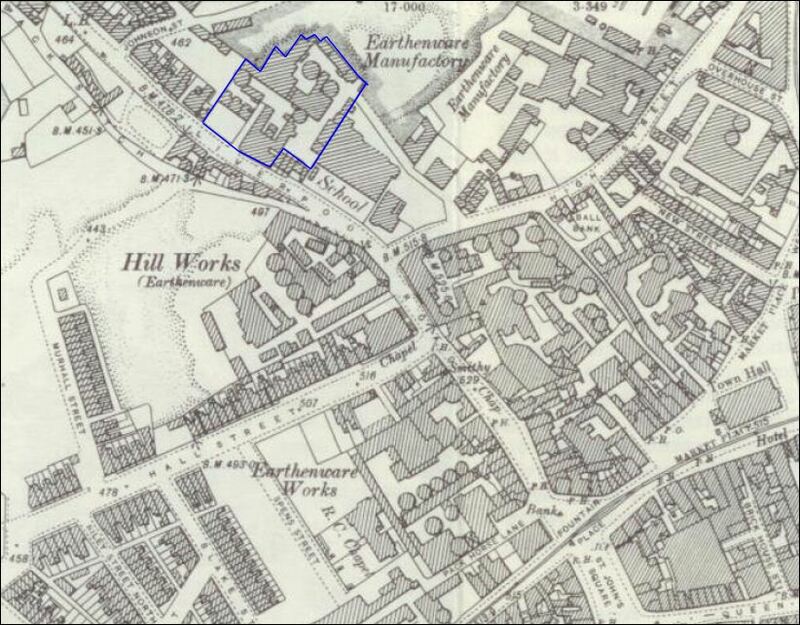 1832 1843 Barker, Sutton & Till In 1833 Wiliam Barker of Snow Hill, Burslem together with James Sutton and Thomas Till of Liverpool Road, Burslem took over the Sytch Pottery from John Hall & Sons. Trading as Barker, Sutton & Till they made general earthenware, lustre ware and figures. In 1842 Sutton withdrew from the business which continued as Barker & Till. 1850 1928 Thomas Till & Son (s) Note: "& SON" is prior to c.1861 when the style changed to "& SONS"
In November 1890 the partnership between the two sons Edwin and William Thomas was dissolved and William Thomas Till continued on his own. At some William Thomas Till joined in partnership with a Charles Henry Salt. 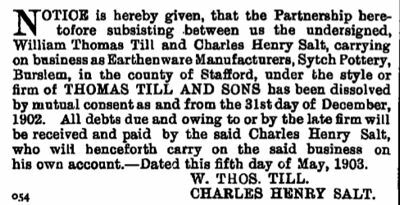 In December 1902 this partnership was dissolved and the business carried on by C H Salt on his own - the name "Thomas Till and Sons" was retained. 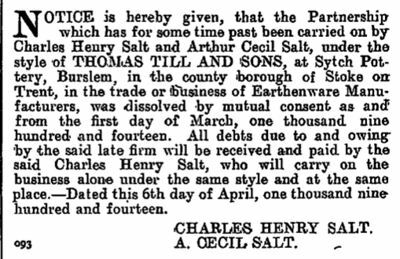 At some Charles Henry Salt joined in partnership with Arthur Cecil Salt - this partnership was dissolved in March 1914 and Charles Henry continued on his own - again the name "Thomas Till and Sons" was retained. The Sytch - a small area north west of Burslem town centre. "The Sytch was the dark heart of the Potteries, an immense stretch of ground composed in almost equal parts of bare clay earth, black water, mud.... and smoke." "Of very old foundation. In the nineteenth century, the Sytch Pottery passed successively into the hands of J. & R. Hall (1802-22) and then J. Hall & Sons. 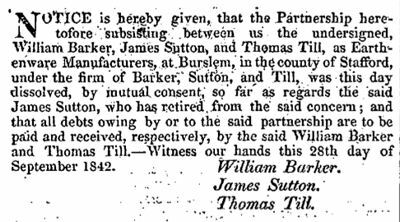 In about 1832, Barker, Sutton & Till took to the works; but at subsequent periods, Mr. Barker and Mr. Sutton withdrew from the partnership. From 1850, it remained in the hands of Thomas Till, who joined in partnership with his sons and the firm became Thomas Till & Sons. The ware produced was good middle-class earthenware. Besides earthenware of the usual average quality - in which services and innumerable useful articles were made by them - Messrs. Till produced coloured bodies of various kinds (cane, sage, drab and lilac); stoneware of a hard and durable kind for jugs, etc. ; jet glazed ware; terra-cotta; enamelled ware; and various coloured lustres. These were principally intended for the home trade. At the Paris Exhibition of 1855, the firm received a certificate of merit. The mark used was the name of the firm in various forms. Messrs. Thomas Till & Sons (Ltd.) continued to 1928." From Jewitt's "Ceramic Art of Great Britain"
Messrs. BARKER, SUTTON, and TILL's Earthenware Factory, Burslem. 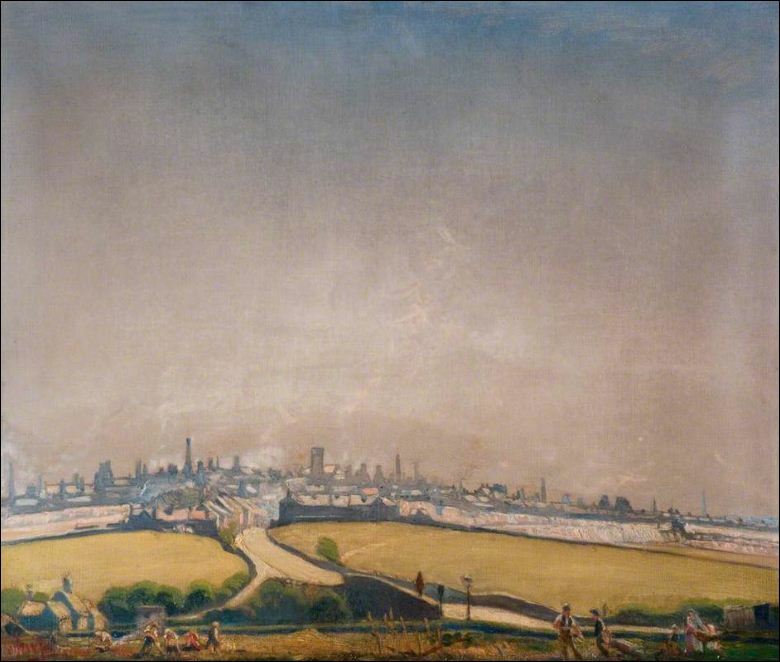 I am a runner of moulds for Adolphus Hancock ; I come to work at six o'clock and go home at six; sometimes stay till half-past seven or eight. I get for breakfast a bowlfull of stir-pudding, as much as I can eat and bacon and taters for dinner; I go home to both; and take the time allowed me, an hour and a half. I am very tired when I get home, and get my supper and go to bed, 'cause I have to be up early next morning. appears on the horizon, surrounded by thebottle kilns of numerous potteries.